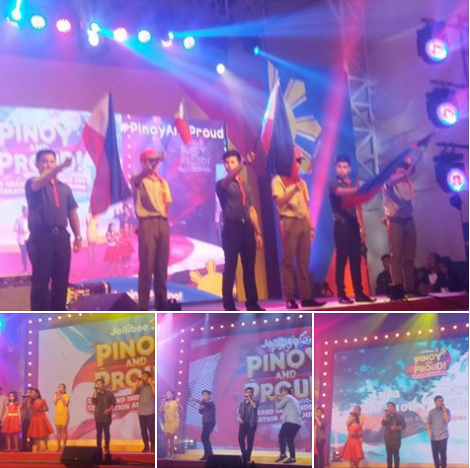 Jollibee brought together world-class Pinoy talent for a grand salubong of the 118th anniversary of national independence last June 11, 2016 at the Metrotent in Pasig City. The star-studded Independence Day celebration featured incredible performances from the brightest OPM stars, including Sarah Geronimo, Darren Espanto, KZ Tandingan, Lyka Gairanod, Darlene Vibares, JK Labajo, Itchyworms, and Spongecola. Zoren and Carmina Legaspi with their twins Mavi and Cassy, also joined in the Jollibee #PinoyAndProud: 2016 Independence Day Celebration and Countdown. It was a resounding success. There’s still plenty of ways to celebrate the sarap at saya throughout June. Embrace and show off your #PinoyAndProud spirit with these Jollibee freedom month exclusives! Wear Pinoy pride literally on your sleeves with the new Jollibee x Uniqlo T-shirts, available at Uniqlo stores nationwide starting June 20. Featuring five new designs, this capsule T-shirt collection is Jollibee’s second collaboration with the global fashion retail giant. The Jollibee x Uniqlo shirts debuted at the countdown event featuring three new different styling collections – athlesiure, summer, and denim. There’s nothing more Pinoy than a family bonding over and sharing their favorite crispylicious, juicylicious Chickenjoy! For the month of June, Chickenjoy will be served in a limited-edition #PinoyAndProud Independence Day bucket. Share delicious, sarap-saya moments with the entire family, barkada, or even the whole barangay! The Legaspi family introduced the new bucket design, now available nationwide, featuring the Jolly Friends in their adorable Filipiniana outfits. One of the highlights of Jollibee’s Independence Day bash is the grand parade featuring the Jolly Friends—Jollibee, Hetty, Yum, Popo, and Twirlie— donning their new Filipiniana finery for the first time ever. Share the #PinoyAndProud fever with your family and friends with the Jollibee Viber sticker pack 2, available for FREE download this June.